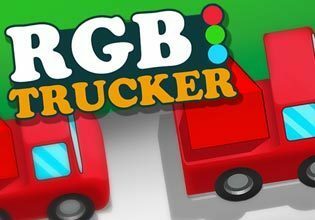 RGB Trucker is a logic puzzle in which you have to deliver cargo with a truck that matches it's color to the appropriate factory. This may sound easy, but the thing is, that once a road is used by a truck, it can't be used by another. Solely cutting across another route at junctions is allowed. And of course you still have to make sure to prevent crashes at those crossroads and more often than not, you have to think outside box and find different routes to solve a level.Are you able to beat not less than 40 tricky puzzles and deliver the cargo safely? Play RGB Trucker now show the world, that you have what it takes!